1. Ellen. She made a visible difference to the whole thing, it felt much more relaxed than normal, less fussy and less prissy too, she is a fabulous host, but as Carole said, her jibe at Liza was over the line. 2. The majority of the winners made very gracious speeches. It is a worldwide audience, so it can be tempting to bang on a bit. Or make a political point, but despite the resonance behind Steve McQueen, Cate Blanchett, Lupita Nyong’o and Jared Leto’s speeches, they weren’t preachy about it. 3. P!nk’s performance had the hairs on my arms standing up. 4. The selfie was truly a glorious moment, and I love that it whizzed it’s way round the world so quickly. 5. That while the whole thing was live on Channel 9 in Australia, I had recorded it so I could fast forward the boring bits. 6. Plastic surgeons have a lot to answer for. There were people on the stage (Kim Novak, Jim Carey, John Travolta to name a few) and people in the audience, (Liza) that have gone way too far and that the people that have operated on them should be made accountable. These talented people now being made a mockery of by looking like they’re in a wind-tunnel, with frozen faces. How are you supposed to act when you can’t move your face because it is stretched so tight your eyes disappear and you can’t open your mouth? I don’t get it, please let’s just let it lie now. 7. The atmosphere in the audience when they were walking around just being silly, reminding us that it is a job like any other and they are all normal people, just looked at through a microscope which is enough to drive anyone crazy. 8. In Memoriam was interesting, choosing one title or feature to sum up a career can’t have been easy – and I can’t honestly say that I agreed with some of the choices made for some of the people that were remembered. However, ending on Phillip Seymour Hoffman had me in tears, then to follow it with Bette Midler; well, I was a mess. I’m still processing the passing of him, it’s taking me longer to sort through than when you hear about someone in the public eye passing away. I’m not sure why. 9. Bill Murray recognising Harold Ramis was a sweet moment. 10. 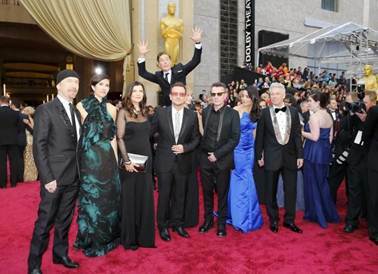 Benedict Cumberbatch photobombing U2, although not part of the ceremony – it was still priceless!